For superior urgent care, primary care, and occupational health care services in Salinas, Monterey, Santa Cruz, and Surrounding Communities, patients know they can trust Doctors on Duty. We provide fast and affordable medical services at several locations throughout California, including the Salinas, Monterey, and Santa Cruz areas, where we employ a skilled, bilingual staff of physicians and other experienced health care professionals. Our urgent care clinics offer essential health care services at a lower cost than the emergency room, with shorter wait times and extended evening hours at select locations for added convenience. With multiple offices throughout Coastal California, we’re the medical clinic that you and your family can turn to when you simply can’t wait to be seen at a traditional doctor’s office. We provide care for non-life threatening conditions – whether it’s a cold or flu, a broken bone or allergic reaction, or even a minor burn or sprain. We also provide traditional primary care services, including school and sports physicals, wellness exams, flu shots, x-rays, and lab tests. We understand that life is unpredictable. 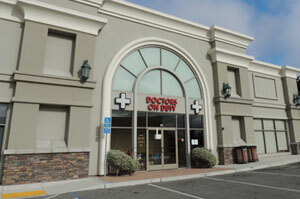 At our walk-in clinics, we see patients with or without an appointment. 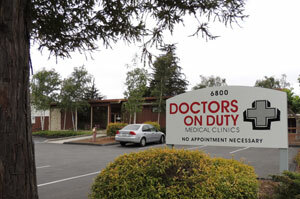 Multiple Doctors on Duty clinics are even there for you on nights, weekends, and holidays. We accept most major forms of insurance, including Medicare, yet we also welcome self-pay patients without insurance or with high deductible plans. Fees vary by treatment, but our prices are a fraction of what you would pay for emergency room care. At Doctors on Duty, we’re more than an urgent care center – we’re one of the most trusted occupational healthcare providers in Salinas, Monterey, and Santa Cruz, CA. Our occupational health programs are delivered in partnership with the extensive resources of the Salinas Valley Memorial Healthcare System. Patients and their employers turn to us for work-related injury evaluation and care, DOT exams, drug and alcohol testing, immigration physicals, and many other commercial health care services. And, because our doctors believe in taking a proactive approach to medicine, we also offer medical monitoring and surveillance testing for employees in nearly any industry. We take a full-service approach to occupational medicine, and strive to be convenient for both employers and employees. Our helpful, bilingual staff at Doctors on Duty will even simplify the paperwork and billing process for corporate healthcare administration personnel, so that our clients can focus their efforts on what’s most important: health, safety, and productivity in the workplace. Whenever you need us, we’ll be there. Simply find the location nearest you in Salinas, Monterey, and Santa Cruz, or one of our other clinics in the area, and come in for fast and affordable care, or call to request on-site occupational services. Can't wait for an appointment to see a doctor? At Doctors on Duty you don't need an appointment. Often times, a delay in treatment translates into escalating costs of care as complications arise. From physical examinations for school or work to moderate asthma attacks, insect bites, poison oak, sore throats, minor burns, or ear infections, we can help you handle the most unexpected health challenges life has to offer. In today's competitive business environment, the health and productivity of employees are key indicators of a company's success. A healthier workforce means a more competitive and profitable business.